The first phase of the Rainier Court redevelopment project, 208 senior units with commercial space, will open in December. As construction of the first phase of the Rainier Court project nears completion in December, it marks the achievement of years of effort by people working to improve the image and investment climate in the Rainier Valley. The Courtland, with senior housing and commercial space, will open in December. The Dakota, with family housing and commercial space, will be completed in summer 2005. Two future phases will add lower-density housing in 2006. When Southeast Effective Development (SEED), the local community development agency, began working on Rainier Court in 1996, it was responding to many community goals. The agency, with its mission of revitalizing the Rainier Valley, saw the potential of taking underutilized land that had been a neighborhood blight for 30 years and turning it into a high-profile project, attracting people and investment to the area and setting a standard for the future. 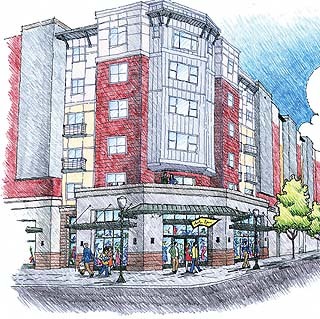 Senior Housing Assistance Group will lease out 208 units of affordable elderly housing at the Courtland. Phase I. The Courtland at Rainier Court is under construction and will be completed in December 2004. The 208 units of affordable, elderly housing are being leased by the Senior Housing Assistance Group. Seattle Metropolitan Credit Union and medical services have rented all but 2,500 square feet of the commercial space. Phase II. The Dakota at Rainier Court is under construction and will be completed in October 2005. Independent Living will manage this building and will begin leasing the 178 units of affordable, family housing in spring 2005. About 8,000 square feet of commercial space will be included. Phases III and IV. Both are still in the conceptual stage of planning and may be developed concurrently in the 2006. At this time, the project will include additional housing and about 4,000 square feet of commercial space. The housing will be in a mid-rise building adjacent to the Phase II project with less dense housing, including fourplexes and town homes. SEED is analyzing the feasibility of providing for-sale housing in this phase. 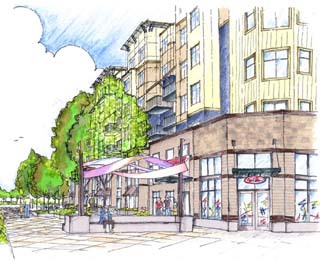 The Rainier Court project has met SEED's expectations and is also fulfilling the community development and urban design goals established by numerous community plans, Seattle's Comprehensive Plan and the Growth Management Act. Rainier Court is located on Rainier Avenue within the I-90 urban village. It adds affordable housing, services, pedestrian traffic and density to this inner-city community. Independent Living will manage the Dakota's 178 units of affordable family housing. The site is well served with urban infrastructure. It is across the street from Rainier Valley Square Shopping Center, and within walking distance of schools, recreation and medical facilities. Metro has three bus routes serving the site and it is within .25-mile of two stations for Sound Transit's Link light-rail line. Development of the site also achieves a national goal of reclaiming contaminated land for productive and sustainable reuse. The site was an unregulated landfill in the 1930s and ‘40s, and subsequent uses and illegal dumping added to the contamination. The land's condition was another deterrent to private development due to the added cost and risk. During the course of site assembly and redevelopment, a team of agencies led by the EPA provided favorable loans and technical assistance to clean up the site to state Department of Ecology standards. This assistance was a critical link in securing development partners and financing for the project. Getting to this point has required the work and support of a diverse public-private development team. Partners with SEED include: Pacific Northern Construction, Senior Housing Assistance Group, U.S. Bank, the city of Seattle, King County Brownfields Showcase, Washington State Housing Finance Commission and state agencies, U.S. Environmental Protection Agency, and the Environmental Coalition of Seattle. The development team includes Johnson Braund Design Group, Intercity Construction, Barghausen Engineers and GeoEngineers. Pat Chemnick has been economic development manager for SEED for 14 years and previously worked for the city of Seattle. She has 30 years of experience in local community development.